After my last update I was unsure of the way the piece had started to look and I agreed with my mini critique that the bottom looked like a wicker chair. I decided I didn’t like it and wanted to change it because it wasn’t the reaction I wanted. I begun to cut and move the wire and position them in different places to change the form it was sitting in. I wanted it to look more bowl like and that’s what I did. I really liked the two pieces separately but when I had put them together they just didn’t look right. Because the piece has to fit in a awkward space and needs some height, I decided to find a way to hang the bulb part of the sculpture. I would have liked to have hung the piece in the unit from fishing wire so that it could have appeared to be floating but it would involve putting a hook in the top of the clients unit and I don’t think they would have liked it. 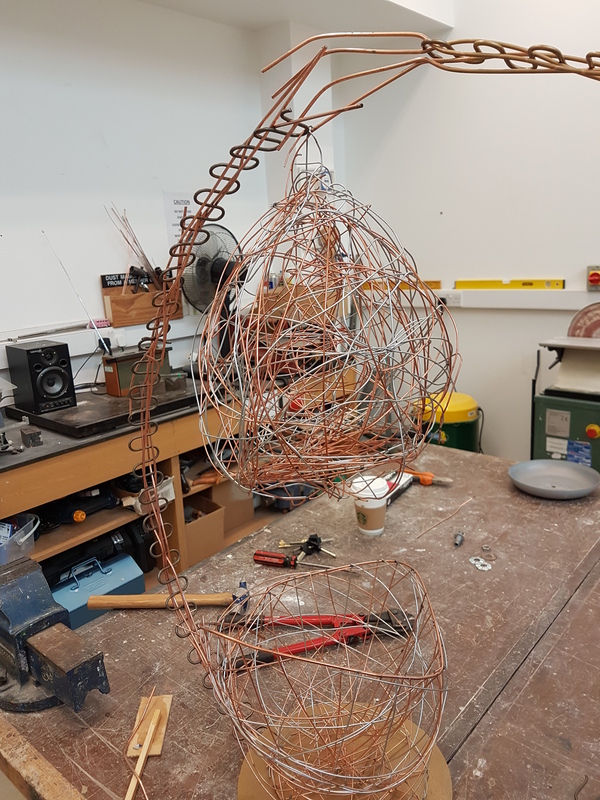 Finding a solution had proved difficult and it was suggested using an old bed spring and copper wire rods to make an arm which I actually liked and decided to spray gold but I would need to find a way to make a base that can balance and hold the arm in place. It was suggested to use an old Ikea lamp base which could be sprayed and a wooden gold sprayed base on the top. Unfortunately I had to extend the arm with another bed spring and more copper rods for the bulb part to hang in the right position but I didn’t mind that. I really want the piece to sit right and I have invested a lot of time in to making it perfect. Using the old Ikea lamp and drilling a hole in the cement to fix it in we sealed the hole with Epoxy Resin and let it set but when we tested the piece the arm of the sculpture kept bending and tilting over so the solution didn’t work. While deliberating and brainstorming with others in and around the workshop it was suggested by Jamie to try and set the arm in lead using the metal top that was on the Ikea base as a mould which we had removed. and maybe using some lead in the Bulb part of the sculpture to counter balance it. I was shown how this can be done over at the University art studio and Jamie will assist me in doing this tomorrow. Lead is an expensive material and quite a lot will need to be used but as it is a potential Commission piece it is worth investing high quality materials on. The arm of the piece was referred to as the spine by a fellow peer and I really like that so from now on I will refer to it as the spine. I really hope the suggestion works. Potentially it could work and it will add a professional look to the piece. The Client is coming in to view it and I only have two days left to complete it. It has been a difficult task trying to design something to fit in a particular space, I hope my measurement’s are correct and I hope she likes it.